★★★☆☆ The watch is a nice style and the movement stores a decent amount of tension in the spring to go well more than 24 hours without being wound or worn. I would estimate between 24-48 hours before all energy is used from a full wind. A couple draw backs are the automatic winding is rather noisy and audible from the wrist. The glass material is a mineral glass and not sapphire which considering the elegance of the design seems like a needlessly cut corner considering the lower costs of sapphire glass and many brands now including it at lower price points than this. ★★★★★ Very nice watch that I got at a great pprice. I am impressed by the watch. It is stylish and light enough to forget it's on. 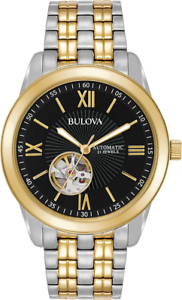 I am a fan of the Bulova line, and I do have some bigger watches, so this one fills its purpose nicely. ★★★★★ Very nice watch for the money.